Sarah Turner in the UK makes incredible works of art. 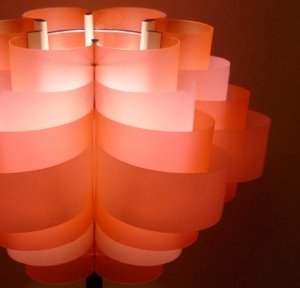 The fact that they’re also functional lights to hang from your wall or ceiling is just a bonus. And then they’re made from recycled materials, which is pretty much the cherry on top of the icing on the cake. 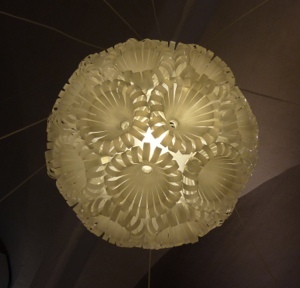 Here is Ella – over 1 metre wide, this amazing chandelier is made from 310 plastic drink bottles. Sarah says that she collected the bottles from local cafes and homes, cleaned them and sandblasted them to turn white. Ella got her name from her umbrella-like shape. Isn’t she pretty? 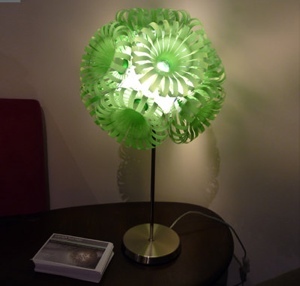 And here’s Sprite 10, a table lamp made from ten old Sprite bottles. Morphed into an unrecognisable beautiful floral design. The lamp comes in traditional green, or the sugar-free blueness of Sprite Zero bottles. Daisy is another one of my favourites – again, made from sandblasted drink bottles and available in a wide range of colours. 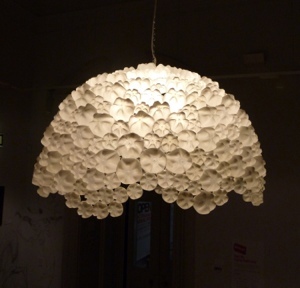 And another stunner – Cola 30 is made out of 30 recycled 1.25 litre Coke bottles. I try not to think too much about the sugar that was consumed to create this sweeeeet design. At least the people who drank the contents of the bottles were technically contributing to the greater good of Sarah’s amazing upcycling into art. And it’s almost impossible to tell at a glance what this ceiling light is made from, which makes it easier to forget about the source! You can check out more of Sarah Turner’s amazing work on her website here and these and many others are available for purchase (wherever you are in the world) in her etsy shop here. Love your work, Sarah!